GLENDALE, Arizona -- Dallas Cowboys owner Jerry Jones has been a staunch supporter of President Donald Trump, so the speculation was that he would not allow his players to kneel during the national anthem. The Cowboys and their owner did kneel, though not during the anthem. 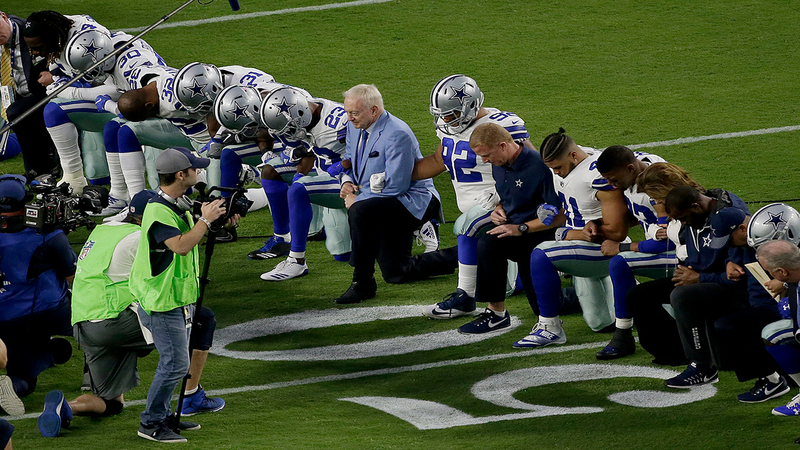 Following a weekend of kneeling and protesting across the NFL, the Cowboys and their owner displayed their own version of unity Monday night, kneeling on the field before rising as a group prior the playing of the national anthem. The Cowboys went into the locker room and returned to the field for the anthem, lining up between the sideline and the yard markers on the field. Arm-in-arm, they dropped to a knee as a giant flag was carried onto the field, with Jones and his family in the middle near the 50-yard line. Numerous boos rang out across University of Phoenix Stadium as the Cowboys kneeled and continued as the players rose, still arm-in-arm, and stepped back to the sideline as the flag was unfurled across the field. They remained connected as Jordin Sparks sang the national anthem. The Arizona Cardinals had their own symbol of unity after a weekend of protests in the NFL, gathering along the goal line arm-in-arm during the national anthem. They were joined by owner Michael Bidwell, his family and general manager Steve Keim. More than 200 NFL players kneeled, sat or prayed during the national anthem on Sunday after President Trump said any player who does not stand for the national anthem should be fired. Three teams did not take the field for the national anthem and numerous NFL owners came out against Trump's statements.